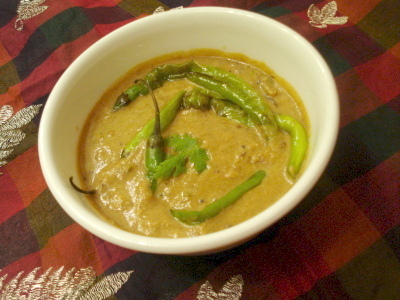 How to Make Hyderabadi Mirchi Ka Salan recipe. Hyderabadi mrichi ka Salan is a tangy and spicy dish. We can make salan with Bhindi or capsicum also. Slit Green chilies length wise without cutting them into two. Remove the seeds and keep aside. After removing the seeds, wash your hands properly else wear gloves while you remove the seeds. Shallow fry the green chilies in 1 or 2 tsp of oil. Chop Onion length wise. Soak the tamarind in water for 15 to 20 minutes. Then extract the tamarind juice from it. Heat oil in a pan. Add Cloves, Cinnamon, Star anise, Fennel seeds and fry for a minute. Once it starts spluttering add ginger, garlic and onion. Fry till onion turns golden brown. Add Coconut and fry for a minute. Remove from heat and let it cool. Grind and make a fine powder of roasted peanuts and sesame seeds. Along with that, add the fried items and make a fine paste by adding water. Heat oil in a pan. Add mustard seeds, Urad dal and cumin seeds. Once it starts spluttering, add curry leaves and onion. Fry till onion turns golden brown. Add the ground paste, Turmeric powder, chili powder, cumin powder and coriander powder. Fry till the oil separates. Add the tamarind juice, water, jaggery and salt. Let it boil for 5 to 10 minutes. Stir it once in a while to avoid burning the bottom. Add the fried green chilies and coriander leaves. Remove from heat immediately.